This tried and true recipe for the world's favorite noodles will leave you craving more. 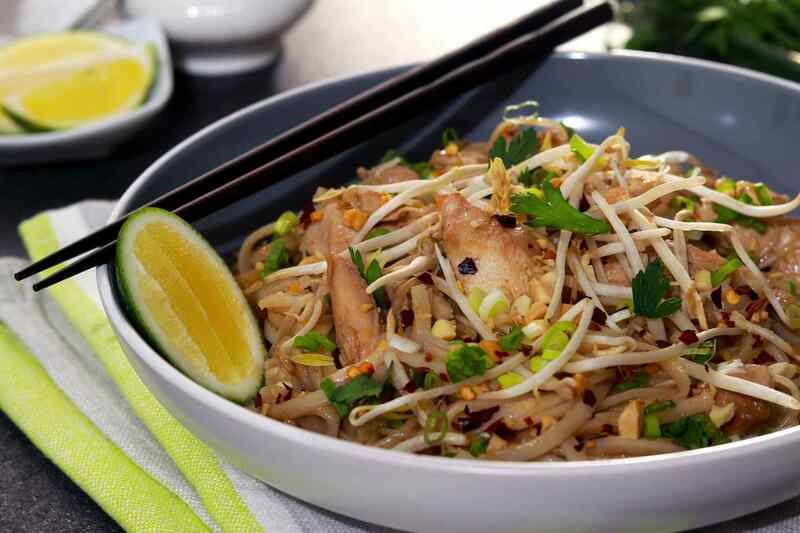 The pad thai sauce is authentic and tangy, with a true balance of flavors. Fry some up for your loved ones and enjoy a Thai food taste experience! There's imitation satay and then there's the real deal. This recipe has been passed down through my husband's family (from Thailand) for many generations and is quite simply the best I've ever tried. Strips of chicken (or beef) are marinated in a special Thai paste, then skewered and grilled on the BBQ or broiled in the oven. Even your kids will love it. This Mango Sticky Rice Dessert (Khao Niaow Ma Muang) is a classic Thai dessert and SO scrumptious. The rice is made in a pot on your stovetop, then topped with slices of fresh mango and smothered in an easy coconut sauce - pure heaven! This salad will blow you away with its astounding flavors and delicious mix of textures. And as a bonus, it's very healthy, low in calories and fat. Enjoy it as a fantastic side dish or make it into a complete meal by adding cooked shrimp, chicken, or deep-fried tofu if you are vegetarian. Any way you toss it, this salad will be sure to win rave reviews from all your culinary fans. One of the signature dishes of Thailand, this classic Thai pineapple fried rice is the real thing. The rice is fried up with chunks of pineapple, plus cashews, peas, and currents with a curry-flavored sauce. Includes cooking tips to create perfect fried rice every time. Mmmm - heavenly! This Thai Green Curry Chicken recipe features chunks of tender chicken simmered in a homemade green curry sauce along with healthy vegetables. The result is a gourmet-style Thai green curry that is very aromatic and beautiful to serve (great for entertaining!). You haven't tried Thai food unless you've had a good green curry. If you want to impress your family and friends without going to a lot of work, put this sumptuous dish on the menu. The curry sauce recipe is easy to make - just stir together a few basic ingredients, or blend them up in a food processor, chopper, or blender. Chunks of juicy pineapple plus coconut milk and dry toasted coconut for a tropical-tasting curry you'll want to make again and again. For authentic Thai flavors, cook up this chicken stir-fry. It features the flavor of lime with bell peppers and fresh basil for a taste explosion that's beyond the scope of most stir-fries. Serve with rice or noodles for a true Thai taste experience. Coconut rice makes a terrific accompaniment to many Thai and Indian dishes, but it's equally wonderful with many Western-style entrees. Quick and easy to make, this coconut rice recipe will come in handy for those times when you want to make dinner extra special without going to a lot of extra work.